Giving feedback is an essential component for portfolio work. You can give feedback not only on individual artefacts but on entire portfolio pages. files: when editing a file. notes: when editing a note. pages: in the advanced options. You can see the feedback given so far at the bottom of each portfolio page or the artefact page that contains the artefact’s metadata. The profile picture and name of the author of the feedback is shown. You can see when the feedback author wrote the feedback and also when the last change to it was made. Feedback comments can also contain a rating which shows quickly how well the feedback author likes your page or artefact. As page / artefact owner you see all feedback on your page. Feedback marked as private by the feedback author is only displayed to you and the feedback author. You or the feedback author can make private feedback public by clicking the Make public button next to the feedback. You and the comment author can delete a comment by clicking the Delete button . The comment text is not displayed anymore. In addition, if you delete the comment by someone else, they will receive a notification about it, which includes their comment text. If feedback authors decide to remove their feedback, it is marked as such. Feedback authors can attach a file to their feedback to give you longer feedback or oral or video feedback. The files that they add are placed into your personal Files area so you can use that feedback later on. You can edit your own feedback and feedback authors can edit their feedback if it is the last feedback. As owner of a page or artefact, you receive a notification about new feedback that was placed on it. 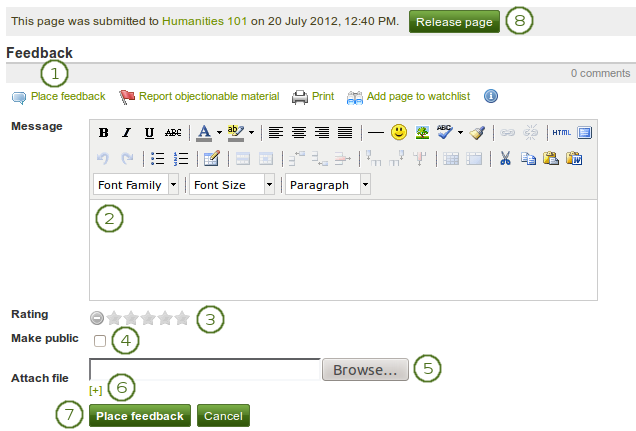 You can give feedback on a page and individual artefacts if the page / artefact author allowed that. Click the Place feedback link at the bottom of the portfolio page or the details page of an artefact for which you want to write feedback. Message: Write your feedback into the editor window. Rating: If the site administrator turned on comment ratings, you can use the 5-star rating scale in addition to your written comments and / or an uploaded file. Make public: Enable the Make public check box when you want everyone who has access to this page to see your comment. If you do not make your feedback public, only you and the page / artefact author can see your comment. This check box is ticked by default. Attach file: Click the Browse button to attach a feedback file from your computer. This file is placed into the Files area of the author of the page. Click the [+] link to add another file. Click the Place feedback button to save your feedback. Click the Cancel button to abort your changes. Once you have placed feedback on the page, the author receives a notification about it. Feedback writers do not receive notifications about additional feedback made by others after they submitted theirs. Only page / artefact owners receive notifications. When you are a member of a group that allows submissions, you can submit portfolio pages and collections for feedback / assessment. This allows an instructor to view the portfolio with much of the content locked into place. Go to the group homepage of the group in which you want to submit a page or collection. You can choose the collection from the drop-down menu under Submit a page or collection to this group. Alternatively, you can select a page, which is not part of a collection, from the drop-down menu. Click the Submit button to lock page content. You do not have to give the group permission to access your page or collection when you want to submit your page or collection for feedback or assessment. When you submit your page or collection, the group administrators and tutors are able to see them and give you feedback whereas regular group members do not have access to them. Once pages or collections have been submitted for feedback to a group, you can give feedback on them without the authors being able to change much of their content if you have the role of a tutor or group administrator in that group. You see all submitted pages and collections with a time stamp on the group’s homepage. You can now give feedback on the submitted individual pages or pages in a collection and then click on the Release page / Release collection button so that the authors can continue working on them. Make public: Enable the Make public check box when you want everyone who has access to this page to see your comment. If you do not make your feedback public, only you and the page / artefact author can see your comment. This check box is not ticked when you give feedback on submitted pages or collections. Click the Place feedback button to save your feedback or click the Cancel button to abort your action. Click the Release page or Release collection button to allow the author of the page or collection to continue editing.